I find when there is a lesson, quality, memory verse, mindset or habit I’m trying to gain, I need to be reminded of my goal. Often. Very often. Enter Pinterest. This has become my go-to tool for visual reminders. I’ve been gathering artistically displayed verses and quotes on a board titled “Points To Ponder”. I’ll select a pin fitting my current circumstance and display the image as many places as possible. Seeing these reminders throughout the day has really helped my growth in desired areas, memorizing verses more quickly and often restoring my mindset on frazzled days. One great place to display such prompts is on your phone or desktop. For example, recently I was struggling with feeling overwhelmed. 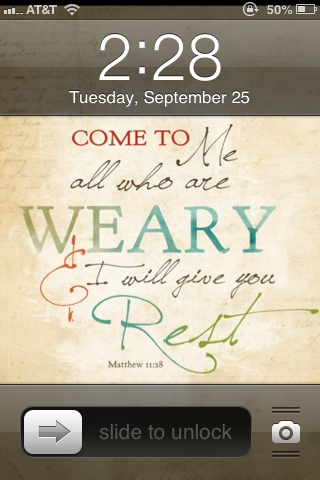 I grabbed a pin from my Pinterest board, copied the image to my phone’s wallpaper and voila! My mind was directed towards the Lord EVERY time I used my phone. Every call, every text brought this verse to mind. Its a little trick that I’ve found greatly helpful. Hopefully it will encourage you too. Get pinning!